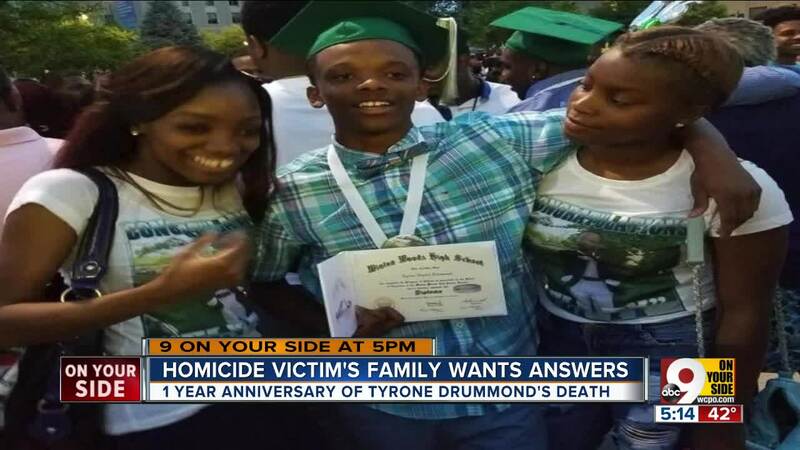 Tyrone Drummond's loved ones are still fighting for justice a year after the 19-year-old was gunned down in Avondale. CINCINNATI — Tyrone Drummond's loved ones are still fighting for justice a year after his slaying. The family of the 19-year-old, gunned down in Avondale last January, is still searching for his killer. Drummond died on Clinton Springs Avenue while a passenger in someone else's car. Time has done little to heal the nagging wound in her heart, she said. “The worst part is not being to get any justice, not having anyone come forward about the case,” she said. Details of that night are sketchy. Officers found a crime scene but no victims. A short time later, Tyrone arrived at Good Samaritan with another gunshot victim in critical condition. To this day, it's not clear who drove them there or who was the intended target. “You always hear that murders go unsolved, but this one, it cut deep for us,” Mahogany said. Tyrone's family and friends celebrated his short life with a tearful vigil last July. A graduate of Winton Woods High School, Tyrone was planning to attend Cincinnati State and study construction. His family says he was an outstanding athlete and an uncle. Though small in stature, he was the protector. “My bro really wasn't a bad type of kid that lived a life that should have caused him to be killed,” Mahogany said. “What's not doing the right thing is being quiet,” Mahogany said. Tyrone’s mother moved out of the area recently to get a fresh start. She said she calls the lead detective almost every week hoping for answers. But no suspects have been identified and there have been no arrests.